Love this, but I did notice that it cooks slightly faster on the left than the middle and the right side. My Presto Cool Touch Electric Griddle was given to me about two years ago. I absolutely love it! It is super easy to clean, I just wet a rag with cold water as soon as I turn it off and then wipe it down real quick and it is clean. I love that it has the plastic border to keep you from getting burned, that comes in very handy when you have children. That is also a great feature for me because I have always been clumsy and am always getting burned in the kitchen. This electric griddle has enough space that I can cook a meal for my whole family. I cook everything on it from eggs to bacon, grilled cheese, steak, corn cakes, hamburgers, and anything else I can think of. I love the grease catcher in the front. Everything I cook on it turns out great and is so much healthier because there is a lot less grease. 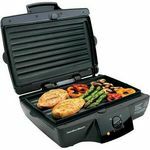 This cool touch electric griddle is easy to use, durable, does not take up too much space, cooks great with very even heating, and is great to have if you have a large family. 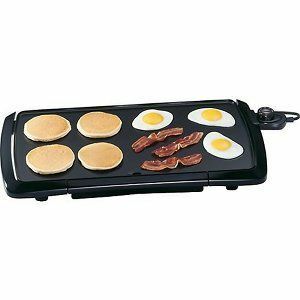 This griddle does an awesome job at making breakfast foods like pancakes, french toast, and bacon. We also love making sandwiches though it doesn't give the grill marks like a sandwich maker does. I love the size of it since the rectangular shape fits best on our countertop. It fits a lot of food on it so it's perfect for a large family so you can make a lot at once. Unlike some other reviews, ours heats evenly and we haven't had an issue there. My only complaint is cleanup after greasy items like bacon. Most grease goes into the grease tray but when it splatters on the sides I find it difficult and awkward to clean it in the sink. It stays on pretty well so you have to scrub really well to get it off and make sure you get it out of all of the crevices. Though it is non-stick we always add a bit of butter or non-stick cooking spray to help make the pancake flipping easier and to help everything brown a bit better. I wanted a griddle for mostly pancakes since our family are pancake lovers. I can be a klutz sometimes with burning myself so I knew this cool touch would be perfect for me. Plus it has a drip tray, which I will admit I have yet to use or clean since I fry turkey bacon and that leaves little grease. I also like how it doesn't take up a lot of space, but I also bought a container for it so I don't have to clean it if it has been a while since last used. And the light on the dial for heating is great. Performance It is so easy to use. Just dial it to the temp and wait for the light to turn off. I've also touched the cool touch and yes it never gets hot. No more burnt fingers! The drip tray is a must for greasy foods and it makes cleaning it that much easier. Durability I've had mine for 3 years and it is still performing like it was out of the box. Everything is sturdy and the prongs are thick so I don't see myself bending them. The drip tray is cheaper plastic and falls out often, but hey it is just for drippings so it doesn't need to be fancy. Ease of Cleaning I first got this when we lived in an apartment and it was hard to clean in a tiny sink with no spray wand and trying to not get the female prong part wet. But once we moved to a home with a nicer sink, it is not so cumbersome. Very easy to clean and everything just.comes right off the griddle. Ease of Use Pretty self explanatory as it is a griddle. Just set the temp and do the rest. Love using this griddle. It is so easy to use, easy to clean and large enough that I can put several things on there at once and eliminate a lot of time spent in the kitchen. This griddle really has it going on... it is lightweight, and as already mentioned, really easy to clean. And, it is easy to cook with too, offering plenty of great versatility so that a wide variety of foods can easily be prepared. i like the way that it evenly cooks all of the foods on the griddle even when you are cooking several different items at one time. Anyone can appreciate this! It is a durable appliance that is affordable and worth the money that you spend. It is great to use in your own kitchen or to take with you. 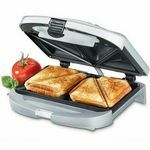 And, with the great cooking ability, versatility and durability you can count on this product exceeding all of your expectations. Performance Makes cooking super simple and easy, offering fast and even cooking Durability I've had my griddle for over one year now and it works just as perfectly as the day that I bought it. The Presto Cool Touch Electric griddle is nothing fancy but it does a great job at making simple things. 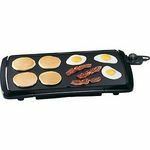 Its very simple to make eggs, pancakes, bacon, sausages and so much more using this simple yet effective electric griddle from Presto. It is so spacious that it has enough room for me to cook many things on it. I can make eggs, bacon, pancakes all together at once which is a time saver at times when I need to make food quickly. The griddle heats up very quickly which is great in my opinion. I like that hardly nothing is left behind sticking to it, it is suggested though I use some kind of oil in order to prevent sticking which I do. It is very easy to use and turn on and off with the griddle's heat controller. I am able to wash it in the dish washer as well but before anything I have to remove the heat controller. This griddle is an inexpensive purchase but is has been very useful for me, definitely worth it and more. Performance Does a great job. Durability Still looking as good as ever. Ease of Cleaning Very easy to clean. Ease of Use Very simple to use. I received the Presto Cool Touch Electric Griddle for Christmas this last year, and I am in love with it! This is the first griddle that I have owned, and I have wanted one for the longest time. This one doesn't disappoint. pros: Cool plastic around the around doesn't get hot, so little fingers reaching up on the counter don't get burned touching the hot griddle. Temperature dial on the plug makes it easy to set how hot I want it. The grease trap is easy to remove and clean. The whole unit is submersible. Meaning, that after you unplug it, you can stick it in your sink and wash it off. The non-stick surface makes it easy to clean too. cons: if I had to come up with one, it would be the length of the cord. It is a little too short for what I need in my kitchen, but I make it work. Performance I have used this for french toast, pancakes, sausage, hashbrowns, pork chops, hamburgers, etc. I love using it, and it works great each time. Durability I have had it for 3 months now, and it isn't showing any wear and tear on it. It is a strong unit. Ease of Cleaning Just unplug, and stick it in the sink to wash off. I love this! The grease trap is easy to clean too. Ease of Use This is the first griddle I have owned, and it was easy to figure it out. Just plug it in, and turn the dial to the temperature you want, and start cooking. The Presto Cool Touch Griddle is very easy to use. It cooks very quickly, but the only problem I have found is that it does not cook evenly. Generally, we like to cook pancakes during the weekend on the Presto Cool Touch Griddle. Because it does not generally cook at the same rate each time, we have to test the griddle to see how fast it is going to cook. So for that reason I have to give it an eight overall rather than a ten. It also cleans very easily which is nice to speed up clean up time. Based on the fact that I was able to get the Presto Cool Touch Griddle for such a great price, I have been fairly satisfied with this product. Performance Overall, the performance is good because it is easy to use, but it does not always cook evenly or in the same amount of time. Ease of Cleaning The Presto Cool Touch Griddle is very easy to clean which makes cleanup time very quick. Ease of Use The Presto Cool Touch Griddle has been very easy to use and great for making a quick meal. I love this pan and it works great for me and my family because there is a lot of room on it so I can get more food cooked in a shorter amount of time. I got my skillet on sale and it is of excellent quality and definitely worth every penny I paid for it with as often as I use it. Performance This griddle works great. 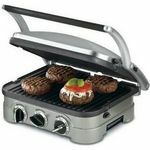 I like that it heats up fast and has a lot of space so I get all my food I am cooking on it cooked evenly. Durability This griddle is very sturdy and built strong so I can cook most anything on it and it handles it with ease. 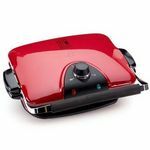 Ease of Cleaning The smooth nonstick surface of this griddle makes food come off easily and cleaning it is simple because of the smooth flat surfaces. Ease of Use I like how simply this cooking griddle is made. The simple design and location and connections locations are in good areas so I can easily use this griddle and cook all the foods I am preparing easily and in a short amount of time so we all can eat together. I love to cook breakfast for my family but I do not love all the pans I have to clean up afterwards. I finally had enough of dealing with everyone having to eat in shifts and the massive amount of dishes afterwards and bought this appliance. The Presto Cool Touch Electric Griddle has simplified my life! Now I can cook enough on the griddle to feed everyone at once so my family can all sit down together for a nice home cooked meal. Also, because it is just a griddle I only have one thing to clean up afterwards instead of five or six pots and pans. I love my electric griddle and am so glad I bought it! This appliance is well worth the money. Performance This griddle cooks everything evenly and does not burn your food. Also, food slides right off so I do not need to use grease to cook with making this a healthier way to feed my family. Durability This has stood up to many months of constant use and works as well as it did when I took it out of the box. Ease of Cleaning It is very easy to clean this appliance. Ease of Use All I have to do is turn it on and cook. This is a very simple and effective way to cook meals.